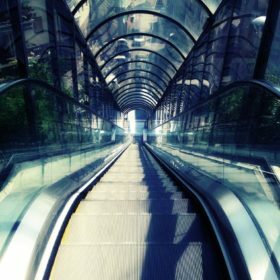 The H Escalator family is ideal for any busy public transportation environment where human traffic is constant, such as train stations, airports, and metro stations. The H Escalator family features a reinforced frame and resilient components to ensure high performance in demanding environments. Since passenger safety is our first priority, our escalators for public use fulfil the safety requirements of current regulations, thus offering exceptional durability. Without balustrade, standard H Escalators support a vertical rise of up to 12 m. Contact us to discuss your particular requirements for the inclination of stairs with different height differences. Note 2: with VVVF control system, two drives, or steps 600 mm wide, vertical distance increases by 500 mm. Note 3: if H>=7 m, choose the BR model; if H<7 m, choose the SR model. Estensioni o riduzione della lunghezza/Extensions or reductions of length Rispetto alle dimensioni standard sono disponibili estensioni fino a 500mm e riduzioni fino a 200mm/Relative to the standard dimensions, extensions up to 500mm and reductions of up to 200mm are available. Installazione/Installation position Interno/Esterno – Indoor/Outdoor. Looking for an escalator for a public building? Looking for a system which truly stands the test of time?